Atlanta, GA, December 6, 2018: Sangam, a soulful confluence of world music, was held at the Sandy Springs Performing Arts Center on November 17. The concert endeavored to bring world music and traditional and classical Indian music at a common meeting point. 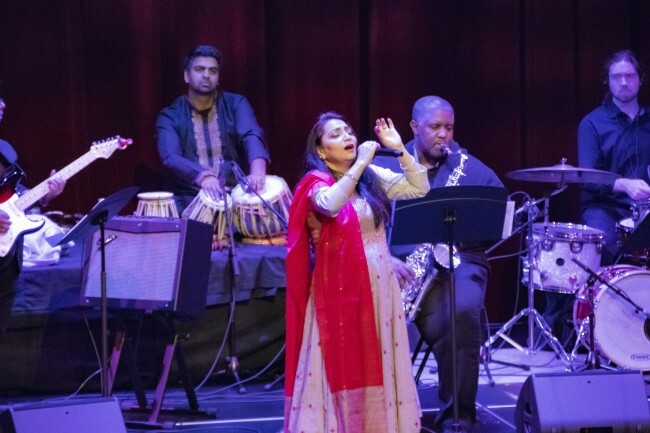 The unique concert was conceptualized and performed by Atlanta based Preeti Uttam and Jayantha Pathak, and other fine musicians from the US who have been contributing to the cinematic arts for decades, besides promoting Indian classical and traditional music in various parts of the world. 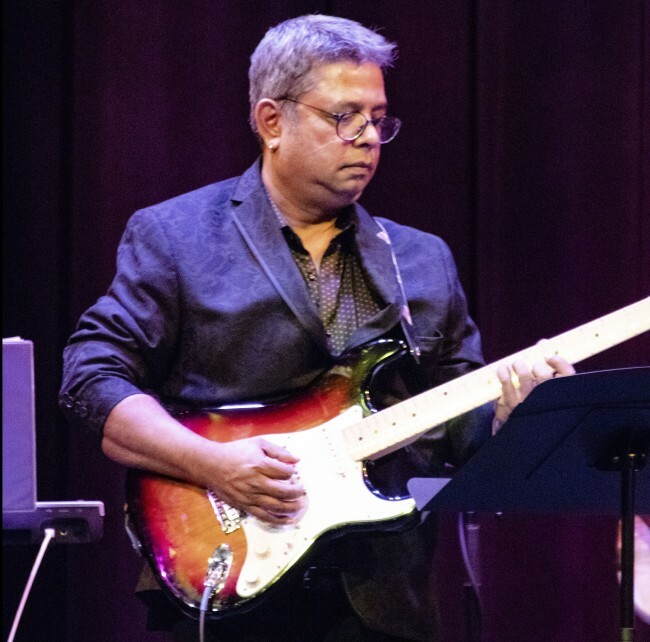 Musicians included Preeti Uttam, Jayanta Pathak, Souryadeep Bhattacharyya, Priyal Shah, Wilgens Pierre, Eamon Dutta, Saras Jain, Court Tatum, Antonio Bennett, Amol Khanapurkar and Keia Nicole Walker. The concert featured some very interesting vocals and instrumental renditions encompassing original creations along with traditional melodies fromIndia. 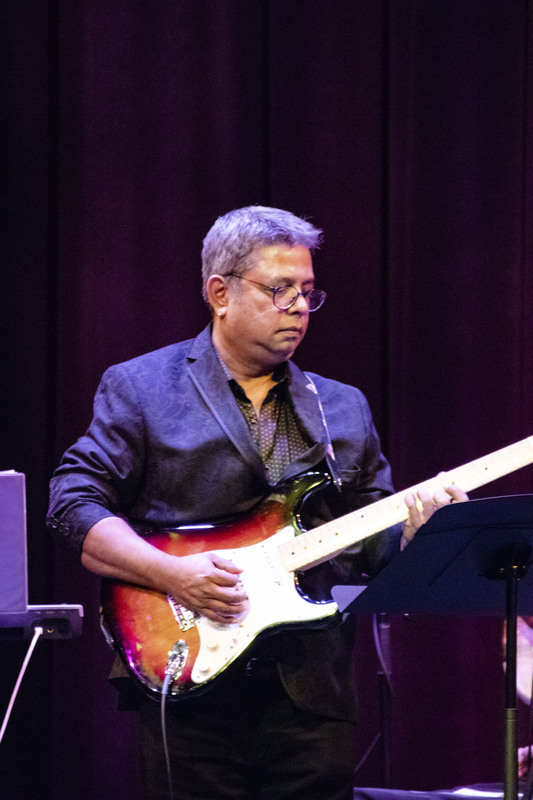 Collaborative music performances were featured consisting of original themes, light Indian classical and traditional melodies and songs from various parts of India dating back to the 15th century to the modern times with urban music and a touch of contemporary jazz. The chorus included disciples of Uttam including Meher Kaur Tucker, Riya Daftari, Sunidhi Vudutha, Arvin Sethi, Arya Supehia, Aarohi Soodan, Ana Daftari, Abhay Daftari and Aatre Rao. Emcees Jui Sohani and Anoushka Pant held the proceedings together. Preeti Uttam is a Bollywood playback singer, and is the daughter of music director Uttam Singh. She was one of the child singers in the very popular “Lakdi ki kath,i kathi peghoda” (“Masoom”, 1983). She went on to sing several Hindi film songs including the critically acclaimed “Charkha Chalati Maa” (“Pinjar”, 2003). After her first album “Preeti”, she worked on the album “Aathwan Sur – The Other Side of Naushad” (1998) in which she sang songs composed by the legendary music director Naushad along with singer, Hariharan. She later collaborated with her father on the album “Sur” (2002). Pathak is a composer, musician, music producer with such ease and finesse, that it is difficult to figure out which role he juggles best. Pathak has been working since the early 90s as a musician in Indiaand UK. His album catalog spans the 90′s and 2000s with his widely acclaimed efforts in more than four dozen major music albums (Josh, Jalwa, Moksh, Jazba (Nirmal Pandey), Back to Disco, Adaab Nusrat Saab, War of The DJ’s, Romanov Party Mania, Umang, Bollywood dream themes, Channel V popstars etc. )with artists of various genres from India and abroad, including pop stars and other music legends like Melissa Bell (from Soul 2 Soul band), Late Nusrat Fateh Ali Khan, Jagjeet Singh and many leading play back singers from Indian Film Industry. He composed, produced sound tracks and back ground scores under various film productions in Georgia, USA, British feature films in London UK and Indian film industry in Mumbai, India since 1993. He has been involved in recent releases such as Charas, Samay, Perfect Husband, Nachle London, Race 3 (2018), Half Girl Friend (2017) as music director, music conductor and music supervisor. That was a fabulous concert I have seen ever by any Indian musicians with American talents. Great performance and amazing renditions of west vs east. looking for more such concerts.